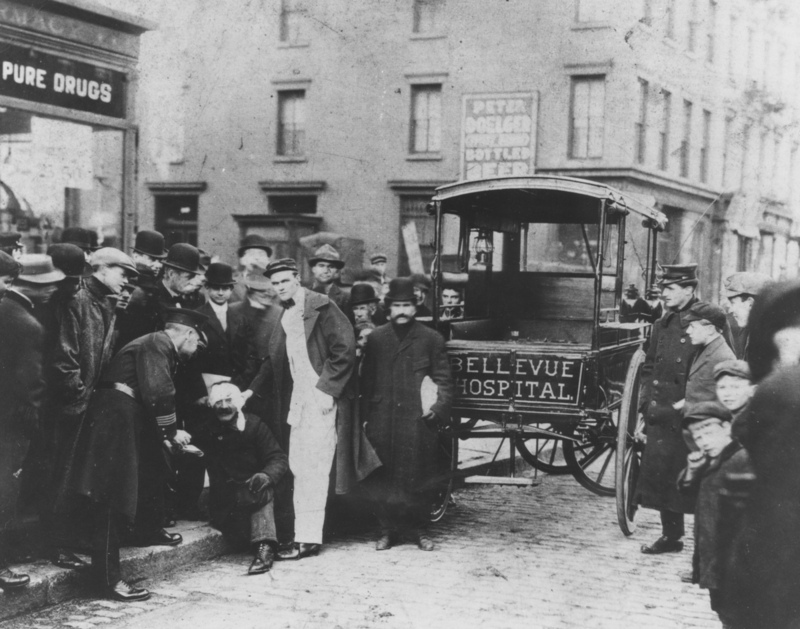 For 200 Years, Bellevue Hospital Treated Presidents And Paupers : Shots - Health News The history of New York's Bellevue hospital is also the history of medicine in the United States. From the days before doctors believed in germs through AIDS, the hospital led the way in innovation. Opened in 1816 on the old Bel-Vue estate bordering the East River, the so-called Bellevue Establishment was the largest and most expensive building project in the city's history to date, containing an almshouse, an orphanage, a lunatic asylum, a prison and an infirmary. 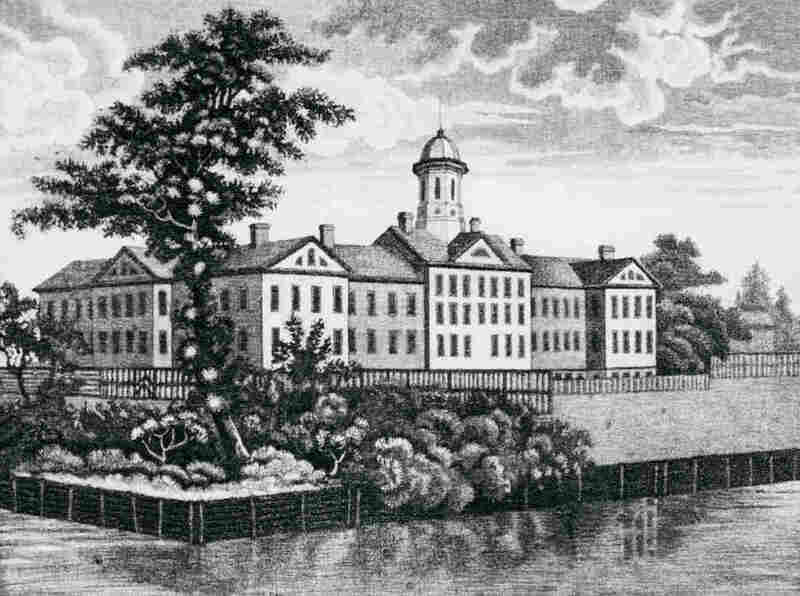 An infectious disease hospital would be added in 1826. When he was growing up in New York, All Things Considered host Robert Siegel always knew that Bellevue Hospital was a city institution. 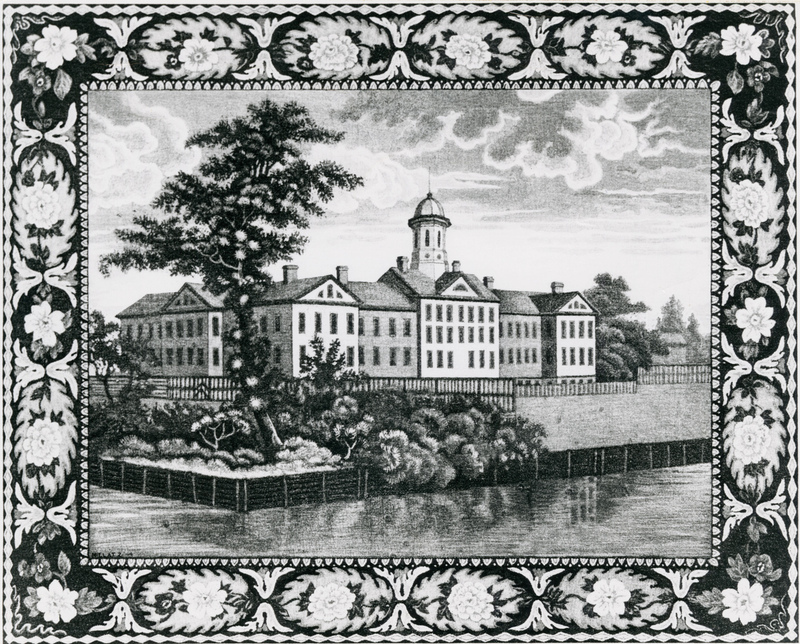 But it wasn't until he read David Oshinsky's book Bellevue: Three Centuries of Medicine and Mayhem at America's Most Storied Hospital, that he realized the hospital was a pioneering institution for all of American medicine. 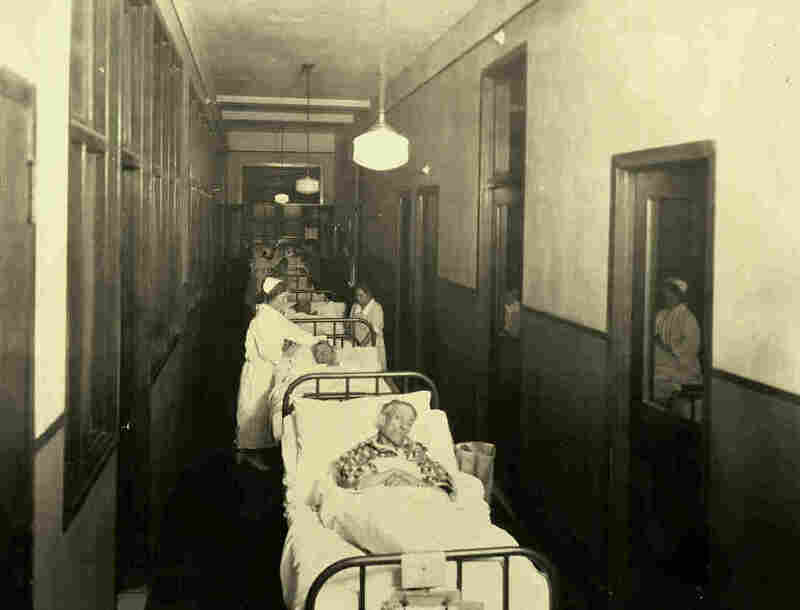 The hospital, which grew out of an almshouse founded in 1736, has been in the forefront of many innovations in medicine in the U.S. Advances that started at Bellevue included ambulances, a maternity ward, nursing school, a children's clinic and forensic pathology. 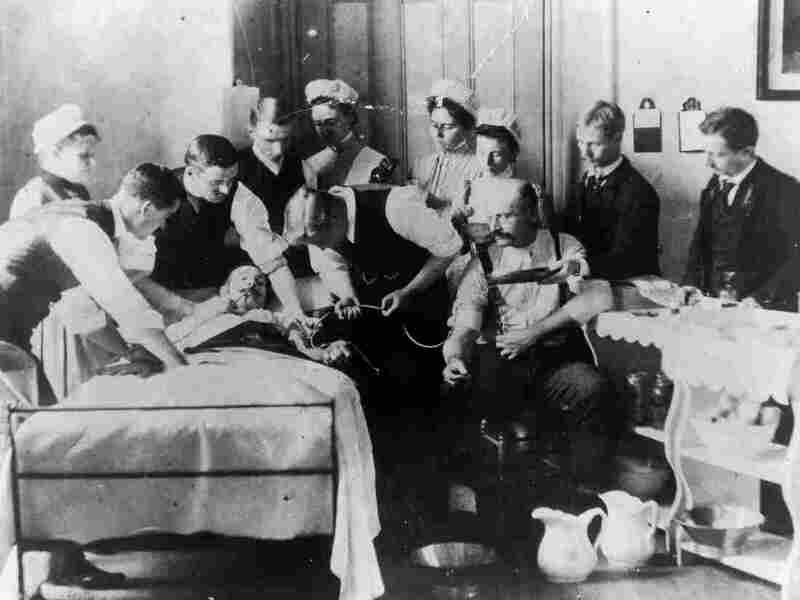 Siegal talked with Oshinsky, a professor of history at New York University, about the hospital and how it reflects the advances and failures of medicine. The interview has been edited for length and clarity. In 1876, O.G. Mason, Bellevue's official photographer, took a carefully staged photograph of a blood transfusion in progress. Bellevue's first class of interns, top, circa 1856. 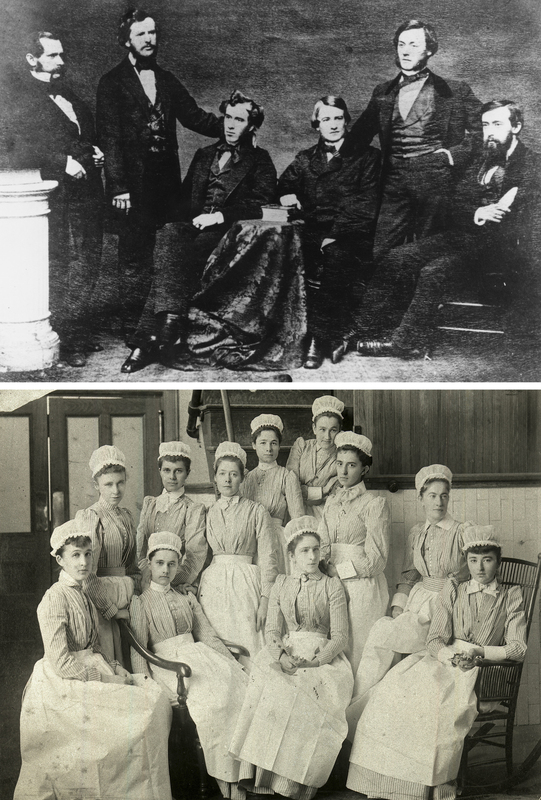 At bottom, America's first professional nursing school opened at Bellevue in 1873. Preferring single, literate, religious women from cultivated families, it rejected most applicants on account of "bad breeding." Bellevue in the 18th century was really both a poorhouse and a pest house. It was a place you came to die. It really began with the great yellow fever epidemics of the 1790s. At that time the Bel-Vue estate, which became the hospital, was located on the East River, about two miles away from where most of New York was located down by the Battery. And you would send people who really had no chance of recovering. Most physicians at Bellevue and elsewhere believed in the miasma theory — that clouds of bad air caused all kinds of disease. They had no concept that an invisible organism could cause so much damage, and that was what germ theory was about. Belluevue physicians were really on the forefront, particiularly the younger physicians, in pushing germ theory forward. You also had a hospital where there was no anesthesia until the 1840s, and once anesthesia comes, postoperative infections are still extraordinarily high. It's only when you have professional nursing and germ care and the coming of X-ray machines and the kind of pathology where you can actually do lab work within a hospital that makes a hospital better at saving a person's life. Applying the lessons he learned as a medical administrator in the Civil War, Edward Dalton organized the nation's first civilian ambulance corps at Bellevue in 1869. Here, a Bellevue ambulance surgeon provides assistance to an injured New Yorker. Garfield was hit by two bullets, neither of which was fatal, but the lead surgeon was Frank Hamilton from Bellevue. And Hamilton came down to Washington and he put his finger into Garfield's wound, and put dirty probes into Garfield's wound. He didn't die from the bullets, he died of the kind of infection was brought about by physicians who didn't believe in germ theory. About 15 or 20 years later, Grover Cleveland had a mass in his mouth which turned out to be cancerous. It was during the Great Panic of 1893, a serious economic depression. Cleveland did not want to alert his critics. So they hired a yacht with a number of Bellevue surgeons and physicians. They sailed up the East River to a very, very calm piece of water and they removed this mass from Cleveland's mouth in a one and a half hour operation using every imaginable antiseptic technique available. Cleveland survived the operation and died of a heart attack many, many years later. During the 1918-19 influenza pandemic, which killed upwards of 50 million people worldwide, patients at Bellevue slept in corridors, closets, and on beds of straw on the floors. No one was turned away. Because it was the place that turned no one away, it dealt with anything that came through New York City: cholera with the Irish in the 1930s, tuberculosis with the Jews and the Italians about the turn of the century, the great influenza epidemics. Bellevue treated more AIDS patients than any hospital in the country, and more AIDS patients died at Bellevue than at any hospital in the country. Bellevue was really in crisis mode at that time. AIDS was one of the big issues at Bellevue and hospitals across the country. Doctors were wary. There were studies done where even a percentage of young interns thought they had the right to determine whether they would treat these patients or not. In the end, and this is the important point, Bellevue prevailed. The Bellevue message prevailed. The ethos that we treat everybody, regardless of their disease, regardless of their social standing. And they did. And I think that people look back at that era with great pride.